Bestowed’s mission is to is to teach people how to eat well. They do this by sending our members (who are consumers) a box filled with the best healthy food and lifestyle products every month. Each product that is included is carefully vetted by leading nutritionist and author Heather Bauer and in every box is detailed product info, recipes, tips, and more. They feature big brands like Natures Path and Zico but are equally committed to featuring smaller/newer brands like Glow and SeaSnax. Brands do not (and cannot) pay to be featured. They introducing themed boxes in September with a back to school box and in October a non-GMO box! I love eating healthy. I love working out. I hate the thought of trying to figure out what healthy foods I want to eat, or what I should buy, or even what is healthy for me. Thankfully, Bestowed has taken the effort out of healthy eating! I no longer have to waste time and effort finding things that are good for me to eat. Instead ,I can go through my goodie box of tasty treats knowing they are healthy and delicious. Inside my box this month were the following items: Seasnax spicy chipotle premium roasted seaweed snack; Reboot, an antioxidant support and detox assistance drink; Miracle Noodle angel hair shirataki pasta; Flax n’ Chia Stix (that are great in yogurt! ); Cascadian Farm organic crunchy granola bars; Mighty Leaf iced tea; and rice tortilla chips. I know most of these products sound unusual compared to what you might normally buy as snack foods, but let me tell you all these products are great tasting! Even my husband who is not fond of trying anything new likes the Seasnax seaweed!! Each month you receive a new box of items to eat and each product is a full size item. These products are chosen for you by a nutritionist so you know what you are getting is actually good for you. I guarantee you’ll love what health foods are being “Bestowed” on you every month!! If you are like me, you are always looking for a healthy snack for you and your family. You are also looking for a snack that is easy and not time consuming to make. For my house, Orville Redenbacker popcorn is the answer. Orville Redenbacker’s popcorn is made with 100% whole grains and is a great source of fiber! Many of the varieties have zero trans fats. You can also buy them in 100 calorie packs! When I was doing Weight Watchers a couple of years ago, popcorn was one of those snacks that they highly recommended. I was actually told at one of my meeting to buy the Smart Pop popcorn, and if I wanted a more butter taste then I should use some spray butter (which would count as 0 points for those of you are using Weight Watchers). What I personally love is that there is a variety for every person or every mood. If I am looking to be healthy, I either eat the smart pop or the 100 calorie packs. If I want to be really naughty, I have the movie theater butter (which is pretty darn close to move theater popcorn though I don’t feel like I am going to keel over with a heart attack while eating it). 1. Leave a comment on this post. 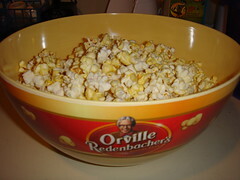 I want to know what is your favorite variety of Orville Redenbacker popcorn. One comment only please and let me know everything you did for your entries in that comment. 2. Blog about this giveaway linking to this page or my home page. 4. Subscribe to this blog using either my email or RSS feed. Now, its up to the winners if they want to enjoy the popcorn on their own or if they actually want to share with their families. I will be running this contest till May 30th at 8:00 pm CST and it is only open to those in the US. Good luck!